Dahr Jamail: “Beyond the Green Zone: Dispatches from an Unembedded Journalist in Occupied Iraq” | Democracy Now! independent journalist who has reported has extensively from Iraq, Lebanon, Syria, Turkey and Jordan. He was unembedded in Iraq and witnessed the April 2004 siege of Fallujah. He is the author of Beyond the Green Zone: Dispatches from an Unembedded Journalist in Occupied Iraq. AMY GOODMAN: The United Nations is calling for a vigorous investigation into a deadly U.S. air raid north of Baghdad on Thursday. It killed at least fifteen women and children. The call comes as the first pictures have emerged in the aftermath of the attack, which took place north of Baghdad. The U.S. military has expressed regret over the loss of civilian life but said they sent in helicopters after ground troops came under fire from insurgents. Iraqi villagers say some of the victims were shot dead. Pictures captured at the scene of the attack show bullet holes that appear to be from a ground assault. The U.S. has admitted six women and nine children were killed, along with 19 insurgents. But local villagers say they have buried 24 people and that several others were detained by U.S. forces. This is how Iraqi witnesses describe the scene. IRAQI WITNESS: [translated] This is their food, their cups. These are women’s clothes. Have a look at these women’s clothes. They killed members of a family inside a house. They shot the children dead here. They shot women dead here. This is the blood from the women who were killed. There were 32. We have buried 24, and I have no information about the other nine who are in U.S. custody. We do not know anything about them. This is a catastrophe. A U.S. general has inspected the area, and he said they are sorry, and he cried after seeing the beheaded children. IRAQI WITNESS: The Americans said that they are sorry, you Muslims. They are sorry for killing the families. They said that they are sorry. Is this democracy? AMY GOODMAN: Iraqis responding to the attack last Thursday by the U.S. military in a village north of Baghdad. Dahr Jamail is an independent, unembedded journalist who has been reporting from the Middle East for over four years. He spent months reporting unembedded from Iraq and is out with a book on his experiences. It’s called Beyond the Green Zone: Dispatches from an Unembedded Journalist in Occupied Iraq. Dahr Jamail joins us from our firehouse studio today. Welcome to Democracy Now!, and congratulations on the publication of your book, Dahr. DAHR JAMAIL: Thanks very much, Amy. AMY GOODMAN: As you watch and listen to these witnesses talking, your thoughts? DAHR JAMAIL: It brought back memories of countless days I spent similar to that, interviewing people under those similar circumstances, people completely outraged at the massive loss of civilian life, usually women, children, elderly people bombed in their homes. It reminded me of when I went into Fallujah after the April 2004 siege and interviewing people whose homes had been completely flattened by bombs, many of their family members still trapped under the rubble. It reminded me of similar interviews I had done in places around Baghdad, where attacks and home raids had occurred, where this is just standard operating procedure for the U.S. military, whether we’re talking about home raids or massive aerial assaults or massive military operations, that the leading — that the highest number of civilian casualties, of course, continues to be generated by the U.S. military in Iraq, particularly using air power, as that situation just showed us very clearly, where, as usual, it’s the civilians paying the highest price. AMY GOODMAN: Let’s talk about Fallujah in April of 2004, a key turning point in the U.S. occupation and war in Iraq. But before we go to Fallujah, describe how you ended up in Iraq. DAHR JAMAIL: I was living in Alaska when the selling of the war commenced during the fall of 2002. And I remember clearly Andrew Card, for example, White House chief of staff, talking about, well, we don’t launch a new product until the fall. And I was outraged in hearing this, the discussion of launching a war being used in the same sentence as a PR campaign. And I was completely outraged. And I, like — I think millions of other Americans were also. AMY GOODMAN: You were living in Alaska? DAHR JAMAIL: I was living in Alaska at that time. I was spending my summers working as a guide and a rescue ranger up on Mount McKinley. But I was really watching the media closely. I had read enough to know that there were no weapons of mass destruction, of course no links to 9/11, and to see right through the lies being used to justify the war. And then, when the war actually broke out and the coverage of that, really more like watching a video game, if you watched the corporate media with the high-tech weaponry being sold on the TVs, etc., and the coverage into the occupation, and I hit a point where I saw, of course, dissent in the country being swept aside, written off as a focus group, according to Mr. Bush, and I hit a point where I decided that it was time to take a risk and go do what I could to try to report on what was actually happening, because I felt that the mainstream media coverage of it was nothing more than — they were doing nothing more than acting as a parrot for the Bush administration. And I figured the best thing I could do as a U.S. citizen would be to go in and try to counter what they were doing by showing the real situation on the ground. AMY GOODMAN: You know, it’s interesting; if you look at what the corporate media did around the war, the whole trumpeting of the allegation of weapons of mass destruction, they might say a person like you, who didn’t have journalistic training going into Iraq, well, if you had gotten it very wrong, repeated allegations over and over again of something that wasn’t true, that’s why you need training in journalism. But it actually was the other way. Here you were, coming from Alaska, just an informed citizen concerned about what the country was doing, and it was they, with all of their training and experience in the networks or in the major newspapers, who got is so wrong. How, when you got to Iraq, did you deal with the other journalists who were there? DAHR JAMAIL: Well, that’s an important point that you make, Amy, because the fact that I didn’t go to journalism school and hadn’t worked professionally as a journalist before, I think, worked to my advantage. And colleagues of mine, like Christian Parenti and Jeremy Scahill, have said the same thing. They said, “You’re doing the job the right way because you didn’t go to journalism school and because you’re not reporting for CNN, that you’re basically just going out and interviewing people and telling the truth.” And that’s really all there is to it; it’s not rocket science. There is no need for this type of formal training. It’s go out, learn the basic skills, and then tell the truth and tell what you see. And that’s the magic formula of what I did. And if a guy like me, a mountain guide from Alaska, can get a laptop and a small digital camera and go to Iraq and start reporting on what’s happening and do things like break stories about home raids and torture and white phosphorus being used in Fallujah, then why can’t the corporate media, with their millions and millions of dollars and all the advanced high-tech equipment available to them, why can’t they do it? And that’s the unanswered question. AMY GOODMAN: So, describe just the nuts and bolts of the trip. You just got your computer and camera and got on a plane. And where did you go? AMY GOODMAN: And that was when? DAHR JAMAIL: That was in November 2003. And I stayed nine weeks that first trip. And once I got in there and started working and went out and started interviewing Iraqis and meeting people, it was clear to them that I was there to report what they were going to say and then actually report it. AMY GOODMAN: And who were you reporting for? DAHR JAMAIL: At the time, I started out only sending out emails to people back home. I had no — I didn’t even know what blogging was. I didn’t have a website or anything like that. I had about 130 people, mostly back in Alaska, that were curious to see what I was seeing. And so, each day I would go home to my hotel and write up what I saw and send it back to these folks. And then a couple of weeks into it, I met someone who suggested I write for a website, electroniciraq.net, which I started doing. And then, from there, I started getting picked up by BBC and a website out of Syracuse called “The New Standard.” And it became clear, oh, I could actually start working as a journalist and then come back here for another trip. AMY GOODMAN: Dahr Jamail, describe Fallujah, how you ended up actually going into Fallujah unembedded in April of 2004. DAHR JAMAIL: I was en route back to Iraq for my second trip, when March 31, 2004, the killing of the four Blackwater USA mercenaries in Fallujah occurred. And so, I knew going in that it would be quite an intense trip to begin with. And I went into Baghdad, and the day I went in, on April 4th, was the day that Fallujah was sealed, and I went in on a bus carrying humanitarian supplies into the city. AMY GOODMAN: This was right after the four Blackwater operatives were killed in Fallujah. DAHR JAMAIL: Right. That occurred on March 31st, and I went into the city on April 9th, and I went in with some other colleagues. And we chose that day because, according to the U.S. military and the corporate media, it was a ceasefire. And so, we knew it would be dangerous, but we figured, well, if it’s a ceasefire, at least our odds will be a little bit better. And we went in, and it was anything but a ceasefire. There were F-16s dropping bombs in the city. There were helicopters strafing. We could hear sporadic fighting all over the place. And we got into the city and took our supplies to a small makeshift clinic in the middle of the city. AMY GOODMAN: What do you mean, your supplies? DAHR JAMAIL: It was — we were on a bus that was set up by an NGO in Baghdad that was carrying in like blankets and rubber gloves and gauze to one of the hospitals inside Fallujah. And they were going — it was a bus, because they were going to try to bring out as many wounded as they could. And so, we basically hitched a ride on that bus, and that’s what granted us safe entry into the city. And at that clinic, when I was there, it was one of the most atrocious things I’ve ever seen in my life. There was, one after another, women, children, elderly being brought into the clinic, all of them from different parts of the city, coming in at different times, all of them telling the same story, that they were being shot by American snipers. And I watched that all through the day and through the night. The doctors were reporting the use of cluster bombs. And this was going on during the quote/unquote “ceasefire.” And that was just one day in that siege, where over 700 civilians died in April, and that set the stage for the November siege. 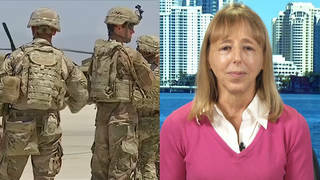 AMY GOODMAN: The U.S. military was denying that civilians were dying? DAHR JAMAIL: They did during the first siege, and then the second siege, which occurred in November 2004, where approximately 70 percent of the city was completely destroyed, according to an Iraqi NGO in the city, 5,000 civilians died. The U.S. military claimed 1,200 people were killed in Fallujah, and all of them were militants. So, such is their denial and such was the reports from the corporate media. AMY GOODMAN: Dahr Jamail, three years after you reported the illegal use of white phosphorus in Fallujah, the U.S. government and The New York Times continued to deny its use. I want to play a clip of our interview with you on November 29, 2004, shortly after that second U.S. military attack on Fallujah that year. DAHR JAMAIL: I have interviewed many refugees over the last week coming out of Fallujah at different times from different locations within the city. The consistent stories that I’ve been getting have been refugees describing phosphorus weapons, horribly burned bodies, fires that burn on people when they touch these weapons, and they’re unable to extinguish the fires, even after dumping large amounts of water on the people. Many people are reporting cluster bombs, as well. And these are coming from different camps that I’ve been to, different people who have emerged from Fallujah, anywhere from one week ago up to on through towards near the very beginning of the siege. AMY GOODMAN: That’s Dahr Jamail in November of 2004. Explain further what you learned then and what the official U.S. government and press line was at the time. DAHR JAMAIL: As I said, at that time there were — I was interviewing refugees and doctors coming out of Fallujah, since I was unable to enter the city during that siege. And so many different people coming out at different times from different parts of the city were telling the same story, that these incendiary weapons were being used. And I reported that to you, and there were a couple of other Arab media outlets that touched on it — I believe Al Jazeera reported it — but basically no one else in the United States reported it. And then, it wasn’t until a year later when the RAI TV, the Italian television, documentary was aired that brought up the subject again that basically the debate was reopened. And then I wrote a story for the Independent that was a series of several that they wrote that essentially forced the Pentagon to admit that they used incendiary weapons, white phosphorus, inside Fallujah. And then, of course, none of the mainstream newspapers here ever reported the story outside of a few editorials. AMY GOODMAN: What was it like being inside Fallujah, seeing the U.S. military from an unembedded point of view? And how did U.S. soldiers deal with you, an American citizen? DAHR JAMAIL: Well, inside Fallujah, I didn’t run into any U.S. soldiers. It was just far too dangerous to get anywhere near the front lines. But outside of Fallujah, whenever I would run through checkpoints and run into American soldiers, mostly they were just relieved to see me and happy to have someone around that spoke English. They didn’t know who I was. I was just any other American reporter to them. They were relieved, because they didn’t have to worry about me attacking them or anything like this, because the reality on the ground in Iraq today is that anyone anytime could be a militant, someone launching an attack against American soldiers. And this is why the situation has degraded into, as the psychologist Robert Jay Lifton describes, an atrocity-generating situation, where when you take young soldiers and put them in a no-win situation, such as Iraq, similar to as Vietnam was, and don’t have any end in sight for when they’re going to leave and get to stay home, then they become desperate, and they’re afraid, and they’re going to start shooting anything that moves. And that is exactly the situation in Iraq today. And if we look at even just the first six months of this year alone, there has been more air power used by the U.S. military than any other six-month period in the occupation. And so, we have a dramatically escalating incidence of civilian casualties. And I think this horrible trend is only going to continue as the occupation grinds on. AMY GOODMAN: The U.S. increasing bombing. DAHR JAMAIL: Right, because it’s indicative of the fact that they’ve lost just about total control of the situation on the ground. I mean, I don’t even know if we should call it the Green Zone anymore, because it’s mortared almost every single day. My last trip in there, over a 90-day period, I think there were maybe three days that it wasn’t mortared. And it’s called the Green Zone because it’s theoretically a totally secure area. And the reality is that it’s not. So — and the rest of Iraq, therefore, by default, is known as the Red Zone, and the reality is that the U.S. military is being attacked thousands of times every single month. They’re not letting up. The situation, over time — the one constant thread we can point to is that it will continue to get worse over time, not better. And then, back home, of course, we have a Congress and a Senate that keeps passing whatever funding the administration asks for, sometimes even more than they ask for, and then so-called Democratic candidates that won’t even have it on the table for a complete withdrawal until at least 2013. So, so much for total withdrawal, so much for compensation being paid to Iraqis, so much for taking care of the soldiers and supporting the troops. AMY GOODMAN: We’re talking to Dahr Jamail, independent reporter, was in Iraq for many months, as well as Lebanon, Syria, Turkey, Jordan, and has just written a book about his experiences, Beyond the Green Zone: Dispatches from an Unembedded Journalist in Occupied Iraq. Back with him in a minute. AMY GOODMAN: Our guest is Dahr Jamail, independent journalist, his book just published today, Beyond the Green Zone: Dispatches from an Unembedded Journalist in Occupied Iraq. Dahr, you continue to write about the situation in Iraq and most recently wrote for Foreign Policy in Focus about the issue of Iran and this drumbeat for war with Iran. Can you talk about Iran’s role in Iraq and the justification that the Bush administration is now using, going from saying they were developing weapons of mass destruction to Iranian soldiers are in Iraq? DAHR JAMAIL: I think it’s important to start any discussion on this topic with the fundamental hypocrisy of the U.S. thinking that they’re in any way positioned to claim, well, Iran is meddling in Iraq and Iran is causing problems in Iraq. The U.S. has 169,000 soldiers in Iraq today, more than at any time so far in the occupation. There’s even greater-than-that number of private contractors, security contractors and their support workers, inside of Iraq. So, that, coupled with the fact that if we’re talking about weapons of mass destruction, the United States has over 10,000 nuclear weapons. The United States has chemical weapons, biological weapons. I mean, this country has the largest military arsenal on the planet, and we’re talking about Iran maybe trying to get nuclear power, not even one nuclear weapon. So all of these allegations are essentially baseless, particularly if we talk about, well, there’s — Iran is sending troops into Iraq or Iran is training people and sending them into Iraq. Well, that might be happening in Iran, but there is no evidence whatsoever to support that the Iranian government has anything to do with that. The borders have remained almost wide open since the beginning of the occupation, and that is clearly the responsibility of the U.S. military, because as an occupying power, their primary responsibility is security of the civilians inside of Iraq, and that would, of course, entail securing the borders, which they absolutely have not done. As far back as my first trip to Iraq in November ’03, I went across the border from Jordan into Iraq — not one single U.S. soldier. Same thing when I came out, same thing when I went back in my second trip. And that trend has continued today. So if the U.S. is going to make these allegations, well, first of all, they need some evidence. And the second thing is, they’re not being creative when they’re looking at selling a war to the American people, or let alone to the world, against Iran. It’s almost a repeat, an exact repeat, of the same PR strategy that they used to sell the invasion of Iraq: well, there’s weapons of mass destruction, etc., etc., except now there’s a little bit of a slant, where if a U.S. soldier stubs his toe in Iraq, well, it’s Iran’s fault. And that’s clearly the trend that they’re taking now. AMY GOODMAN: What about the L.A. Times piece looking at who are the foreign fighters in Iraq, and, in fact, there are far more Saudi fighters in Iraq than Iranian? DAHR JAMAIL: That’s correct. And I mention that in the piece that I did for Foreign Policy in Focus, because I tied it in with the fact that not long ago, as we recall, there was a $60 billion arms deal for the Middle East. Of course, Israel got $30 billion for their quote/unquote “strategic advantage” to be maintained, but Saudi Arabia received $20 billion. And talking about hypocrisy, that’s on top of the fact that, according to that L.A. Times piece, that half of the foreign fighters being held in U.S. detention facilities were actually Saudi Arabian. There were no Iranians. They were over — at least half of them Saudi Arabian. And what has the Bush administration done to stem that? Instead of — I mean, if we can just imagine, instead of having this bellicose rhetoric towards Iran, what if that had been aimed at Saudi Arabia? Shouldn’t it be aimed at Saudi Arabia? Well, of course not, because the Bush administration is in bed with the leadership of Saudi Arabia. So what we have happening is militants coming in from Saudi Arabia attacking U.S. troops, and, of course, a blind eye is being turned towards that. AMY GOODMAN: You traveled extensively through the Middle East and also talked to Iraqi refugees displaced within Iraq. Talk about the refugee crisis today. DAHR JAMAIL: The refugee crisis is staggering. We’re looking at, today, one out of five Iraqis is now a refugee either inside of Iraq or outside of Iraq. I was in Syria a few months back, and I talked to Sybella Wilkes, the UNHCR regional spokesperson there, and she said at that time that there was probably over 1.5 million Iraqis in Syria alone, that she admitted that UNHCR couldn’t even — they didn’t even have enough manpower to have people on the borders tabulating how many people were coming out. But before the recent visa restrictions were added, we were looking at 50,000 people a month coming in from Iraq into Syria. So we’re looking at least 1.5 million in Syria alone, probably another million in of Jordan. And then, inside of Iraq, we’re looking at well over two million people that are internally displaced within their own country. And now they’re in a position where most of them are completely unable even to leave the country. That, on top of the fact that we have a minimum of 655,000 Iraqis that have been killed so far during the occupation, according to the most recent Lancet report, so we’re looking at — we’re getting at well over one-third of the entire population of the country is either dead or a refugee. AMY GOODMAN: Dahr Jamail, today on Democracy Now! we reported on the Iraqi journalist, a writer for The Washington Post, who was shot dead in Baghdad on Sunday. He was 32 years old. His name was Salih Saif Aldin, worked for the paper since 2004. Iraqi police officers say they believe Saif Aldin was killed by members of the Sunni tribal group the Awakening Council, which is aligned with the U.S. military. Your response when you hear about journalists? Of course, now it is largely Arab journalists, media workers, who are dying in Iraq, over 118 by the estimates of the Committee to Protect Journalists. DAHR JAMAIL: Right. And I think that number is far too low. If we look at, for example, the figure from the Brussels Tribunal group, which actually has a complete list of dates, names, and what occurred at the time of death, the total is actually closer to 300, if not a bit over that now. And the reality is that any reporter going out on the streets and going to the frontlines and reporting what’s actually happening is in very, very grave danger. And this has been the trend from the very beginning of the invasion itself, with the U.S. starting by bombing Al Jazeera, both in Baghdad and shelling the reporters at the Sheraton Hotel down in Basra. I mean, this trend — that’s how it started off. That was the message sent to anyone not toeing the Bush administration line, that if you’re going to be reporting something we don’t want you to be reporting, then we’re not going to basically do anything to secure your safety. And that trend has continued to a point where more journalists have been killed in Iraq than any other modern conflict. And it’s the Iraqi journalists now specifically that are really the only ones able to go out and about without being embedded with the U.S. military or militia. They literally are taking their lives in their hands to get the information out. They are the front lines now of the journalism in Iraq. And we’re all reliant on them for this information. And this was — the incident you just spoke of is just another case in point that underscores how dangerous it truly is. AMY GOODMAN: Finally, to young people today weighing what to do with their lives, would you recommend doing what you did, a citizen journalist just reading about what is happening and then deciding you wanted to find out with your own eyes and ears, your own experience, what was happening in Iraq? DAHR JAMAIL: I would not hesitate to recommend that. Of course, I wouldn’t suggest that they go racing into Iraq, as I did, at this stage of the game. But pick a topic that people are — that you’re passionate about, that you want to know more about, that you think is important for people to get that information, and go get involved. The time for an active, vibrant, independent media today, it’s more important that we support that and get involved in it today more than ever before. AMY GOODMAN: Dahr Jamail, thanks so much for joining us. Congratulations on your book Beyond the Green Zone: Dispatches from an Unembedded Journalist in Occupied Iraq. Today begins his 35-city tour. You can go to Dahr’s website at beyondthegreenzone.org to find out where Dahr will be.